Before germs like viruses can make you sick, they first have to make a landing on one of your cells—Mars Rover style—and then punch their way inside. A team of physical chemists at Duke is building a microscope so powerful that it can spot these minuscule germs in the act of infection. The team has created a new 3D "virus cam" that can spy on tiny viral germs as they wriggle around in real time. In a video caught by the microscope, you can watch as a lentivirus bounces and jitters through an area a little wider that a human hair. Next, they hope to develop this technique into a multi-functional "magic camera" that will let them see not only the dancing viruses, but also the much larger cell membranes they are trying breech. "Really what we are trying to investigate is the very first contacts of the virus with the cell surface—how it calls receptors, and how it sheds its envelope," said group leader Kevin Welsher, assistant professor of chemistry at Duke. "We want to watch that process in real time, and to do that, we need to be able to lock on to the virus right from the first moment." This isn't the first microscope that can track real-time, 3D motions of individual particles. In fact, as a postdoctoral researcher at Princeton, Welsher built an earlier model and used it to track a bright fluorescent bead as it gets stuck in the membrane of a cell. 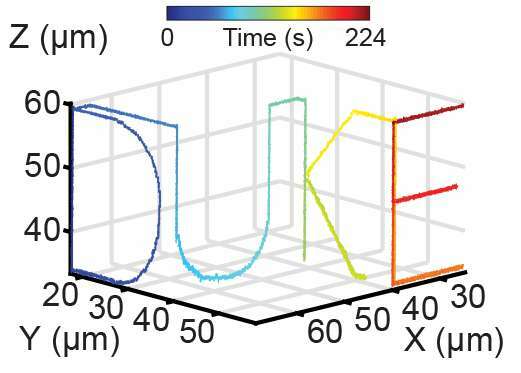 But the new virus cam, built by Duke postdoc Shangguo Hou, can track particles that are faster-moving and dimmer compared to earlier microscopes. "We were trying to overcome a speed limit, and we were trying to do so with the fewest number of photons collected possible," Welsher said. The ability to spot dimmer particles is particularly important when tracking viruses, Welsher said. These small bundles of proteins and DNA don't naturally give off any light, so to see them under a microscope, researchers first have to stick something fluorescent on them. But many bright fluorescent particles, such as quantum dots, are pretty big compared to the size of most viruses. Attaching one is kind of like sticking a baseball onto a basketball – there is a good chance it might affect how the virus moves and interacts with cells. The new microscope can detect the fainter light given off by much smaller fluorescent proteins – which, if the virus is a basketball, are approximately the size of a pea. Fluorescent proteins can also be inserted to the viral genome, which allows them to be incorporated into the virus as it is being assembled. "That was the big move for us," Welsher said, "We didn't need to use a quantum dot, we didn't need to use an artificial fluorescent bead. As long as the fluorescent protein was somewhere in the virus, we could spot it." To create their viral video, Welsher's team enlisted Duke's Viral Vector Core to insert a yellow fluorescent protein into their lentivirus. Now that the virus-tracking microscope is up-and-running, the team is busy building a laser scanning microscope that will also be able to map cell surfaces nearby. "So if we know where the particle is, we can also image around it and reconstruct where the particle is going," Welsher said. "We hope to adapt this to capturing viral infection in real time."